- NOAH Budokan Hall (September 10, '04) = Go Shiozaki & Jun Akiyama were beaten by Makoto Hashi & Takeshi Rikio. - NOAH Destiny '05 (July 18) = Shiozaki & Tamon Honda lost to Takeshi Morishima & Mohammed Yone. - RoH Unified (August 12, '06) = Shiozaki & SUWA fell to Jody Fleisch & Doug Williams. - RoH Anarchy In The UK (August 13, '06) = Shiozaki defeated BJ Whitmer. - NOAH Budokan Hall (January 21, '07) = Shiozaki was pinned by Jun Akiyama. - RoH Eye of the Storm (February 22, '08) = Shiozaki beat Necro Butcher and El Generico, then fell in the finals of the "RoH World Heavyweight Title Contenders Tournament" to Kevin Steen. - RoH 6th Anniversary Show (February 23, '08) = Shiozaki lost to Austin Aries. - RoH Double Feature, Night 1 (March 14, '08) = Shiozaki took down Brent Albright. - RoH Double Feature, Night 2 (March 15, '08) = Shiozaki & Nigel McGuinness were beaten by Austin Aries & Bryan Danielson. - RoH Take No Prisoners (March 16, '08) = Shiozaki lost a "Four Corner Survival" Match to Tyler Black. Claudio Castagnoli and Delirious were the other participants. - RoH Dragon Gate Challenge II (March 28, '08) = Shiozaki, Erick Stevens, & CIMA won over the No Remorse Corps (Davey Richards, Rocky Romero, & Roderick Strong). - RoH Supercard of Honor III (March 29, '08) = Shiozaki defeated Delirious. - RoH Southern Navigation (May 9, '08) = Team NOAH (Shiozaki, Naomichi Marufuji, & Takeshi Morishima) beat the No Remorse Corps (Davey Richards, Rocky Romero, & Roderick Strong). - RoH A New Level (May 10, '08) = Shiozaki lost a "Three Way" Match to the FIP Heavyweight Champion, Roderick Strong. Erick Stevens was the other participant. - RoH Up For Grabs (June 6, '08) = Shiozaki & Nigel McGuinness lost in the first round of the RoH World Tag-Team Title Tournament to Kevin Steen & El Generico. The Age of the Fall (Tyler Black & Jimmy Jacobs) won the tournament. - RoH Respect Is Earned II (June 7, '08) = Shiozaki lost to the RoH World Heavyweight Champion, Nigel McGuinness. - RoH Vendetta II (June 28, '08) = Sweet & Sour Inc (Shiozaki & Adam Pearce) lost, via ref stoppage, to Brent Albright & Roderick Strong. - RoH Northern Navigation (July 25, '08) = Shiozaki fought to a 15-Minute Draw with Erick Stevens. - New Horizons (July 26, '08) = Sweet & Sour Inc (Shiozaki & Chris Hero) were beaten by Naomichi Marufuji & Roderick Strong. - RoH Fueling The Fire (August 1, '08) = Shiozaki & Naomichi Marufuji lost to the RoH World Tag-Team Champs, the Age of the Fall (Tyler Black & Jimmy Jacbos). - RoH Death Before Dishonor VI (August 2, '08) = Shiozaki fell to Naomichi Marufuji. - RoH Age of Insanity (August 15, '08) = Sweet & Sour Inc (Shiozaki & Chris Hero) defeated Brent Albright & Roderick Strong. - RoH Night of the Butcher II (August 16, '08) = Shiozaki lost to the NWA World Heavyweight Champion, Brent Albright. - RoH Driven '08 (September 19, '08) = Shiozaki lost a "Three Way" Match to Bryan Danielson. Claudio Castagnoli was the other participant. - RoH Glory By Honor VII (September 20, '08) = Shiozaki retained the FIP Heavyweight Title, beating Kevin Steen. - RoH Return of the 187 (October 24, '08) = Shiozaki stayed the FIP Heavyweight Champion, defeating Austin Aries. - RoH Ring of Homicide 2 (October 25, '08) = Shiozaki, as the FIP Heavyweight Champ, fought to a Double Countout with Necro Butcher. - RoH The French Connection (November 7, '08) = Shiozaki lost a "Four-Way Elimination" Match to the RoH World Heavyweight Champion, Nigel McGuinness. Kevin Steen and El Generico were the other participants. - RoH Bound By Hate (November 8, '08) = Shiozaki & Eddie Edwards fell to Erick Stevens & Roderick Strong. - RoH Escalation (November 21, '08) = Shiozaki won a "Four Corner Survival" Match over Sami Callahan, Grizzly Redwood, and Rhett Titus. - RoH Rising Above '08 (November 22) = Sweet 'n' Sour Inc (Shiozaki, Chris Hero, & Davey Richards) won a "Six Man War" Match over Brent Albright, Ace Steel, & Roderick Strong. 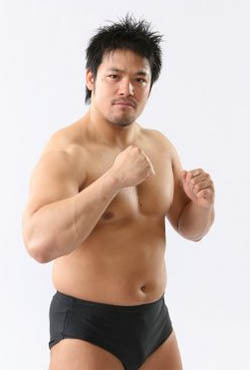 - NOAH The Tournament '08 (December) = Shiozaki won over Takeshi Morishima and Yoshinari Ogawa, then fell to Kensuke Sasaki. Akitoshi Saito won the tournament. - RoH All-Star Extravaganza IV (December 26, '08) = Shiozaki was beaten by Takeshi Morishima. - RoH Final Battle '08 (December 27) = Sweet 'n' Sour Inc (Shiozaki & the American Wolves) lost a "New York City Street Fight" to Brent Albright, Erick Stevens, & Roderick Strong.